Turmeric is a versatile spice used in an Indian household. Whether it is used in cooking, cosmetic homemade face pack or even to ward off ants. If you belong to an Indian family, you sure can relate to using turmeric from your childhood days as an antiseptic application to cuts and bruises. Sometimes to treat burns you must have seen your mother mix turmeric with a little honey and applied it to affected areas. Or a quick remedy of haldi doodh for cold and cough. No wonder this miracle spice is gaining popularity in the west too. ‘Curcumin’ is an anti-oxidant present in turmeric that gives it its yellow color and has all the medicinal properties. While most turmeric has a curcumin conent of 2 to 5 %. The highest curcumin content is found in the Jaintia Hills of Meghalaya with a curcumin content of 7.5% to 9.20%. 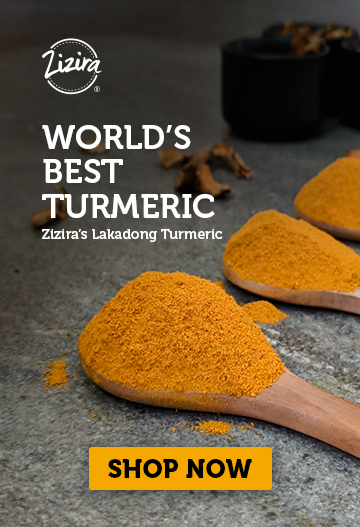 Famously known as ‘Lakadong turmeric‘. To maximize the absorption of curcumin from turmeric by the body, you can make haldi doodh as a home remedy for cold, cough and other ailments. Milk in itself is healthy and nourishing, the fat content in milk also helps in better absorption of curcumin. In most Indian homes, ghee (clarified butter) is still added to turmeric milk, although there are other alternatives today. Almond oil high in vitamin E or olive oil can also be used as other alternatives. Rich in vitamin E, vitamin K, and monounsaturated fatty acids, olive oil is recognized as one of the healthiest edible oils. Piperine, found in pepper (black, white, long) also enhances the absorption of curcumin in the body. It enhances the viability and power of curcumin present in turmeric. 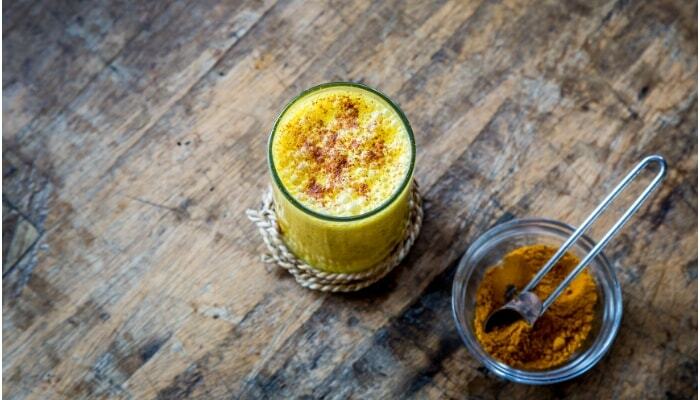 Adding pepper in haldi doodh can facilitate the anti-inflammatory action of turmeric in your body. And, yes you can take haldi doodh daily. How you make your own version is up to you. How to make Haldi Doodh? 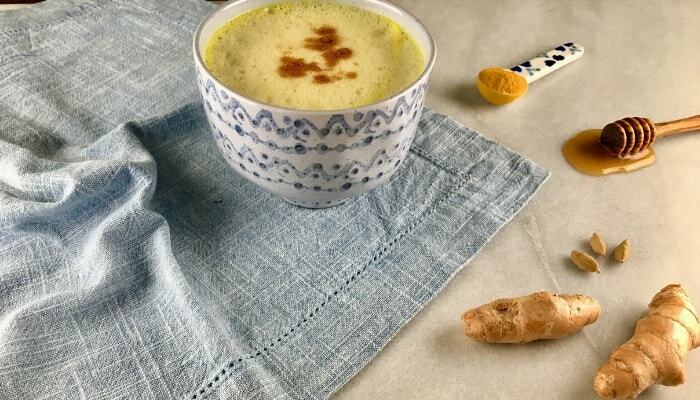 In today’s kitchen, you can find ingredients to whip up a warm and delicious cup of haldi doodh. Take a blender and add all these ingredients into it. Pour in a cup and serve the delicious goodness. Heat the milk in a pan along with 1 teaspoon Lakadong Ker. Remove from heat before it starts to boil. With a small whisk beat the liquid till it starts foaming. Heat the water in another pan along with the coffee until it dissolves (if using filter coffee, strain the coffee after heating). Then pour the hot coffee in a serving cup first then add the honey. 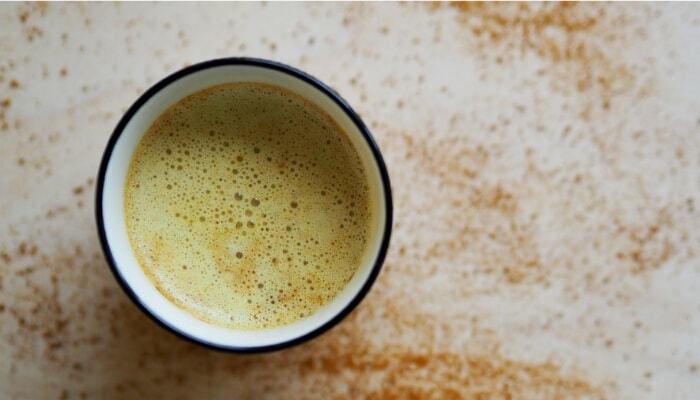 Pour the Golden milk over the coffee and stir, sprinkle some cinnamon powder and enjoy. The most important part of having a cup of Lakadong Ker Golden milk is to sit back and relax for a few minutes, savouring its comforting flavour and exotic aroma! 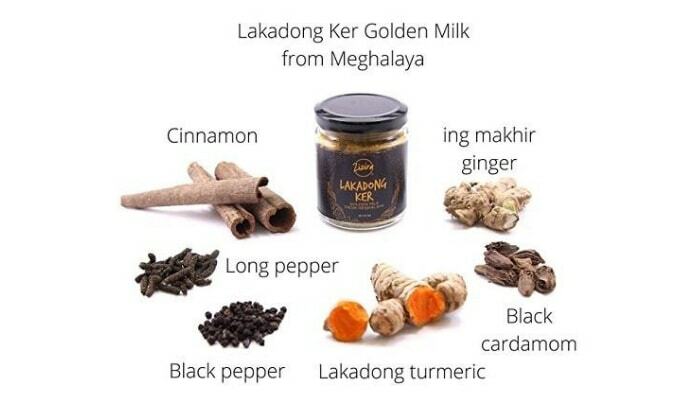 If you’re looking to buy a product that you can easily use for making haldi doodh or Golden, then you can opt for Zizira’s very own Lakadong Ker Golden milk from Meghalaya. The convenience of a health blend readily available in a jar and the accessibility to Lakadon turmeric’s high curcumin is now easier than ever before. Lakadong Turmeric: Turmeric is used in Ayurvedic and traditional Chinese medicine for thousands of years. Curcumin has a powerful ability to fight inflammation and internal disorders such as indigestion, throat infections, common colds, or liver ailments. And Lakadong turmeric naturally has one of the highest curcumin content. Ing Makhir (medicinal ginger): Gingerol is the main bio-active compound in ginger, responsible for much of its medicinal properties. It has potent anti-inflammatory and antioxidant properties. Used to help digestion, reduce nausea and help fight the flu and common cold. Cinnamon: Used as an ingredient throughout history, dating back as far as Ancient Egypt. It is loaded with antioxidants, such as polyphenols. It helps the body fight infections and repair tissue damage. Long pepper: Used since ancient India and combined with other herbs in Ayurvedic medicine. It helps to improve appetite and digestion, as well as treat stomach ache, heartburn, indigestion and flatulence. Black pepper: Another antioxidant-rich ingredient black pepper fights radicles that have the potential to damage the cells of the body. Its active ingredient piperine helps in the absorption of curcumin found in turmeric. Black cardamom: It helps promote smooth and shiny skin. Benefits include its ability to improve gastrointestinal health, protect the respiratory system, boost the immune system. Although we have re-invented the original haldi doodh recipe with our own spice infusion, we believe in the health properties of each ingredient. It is made with great care for reviving your health. 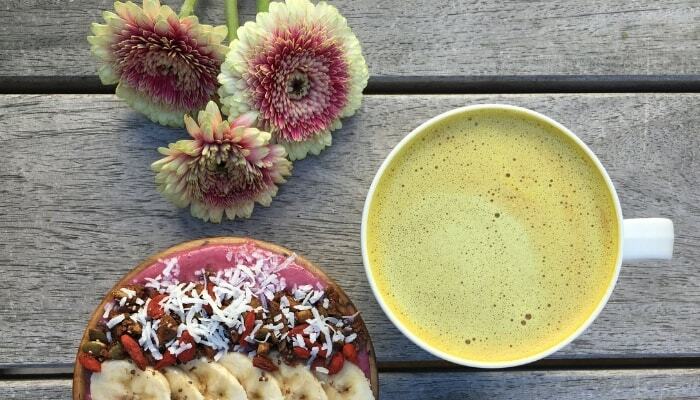 Do you have your own version of Haldi doodh? If yes, share with us we would love to try it ourselves. An occasional reader, grew up reading a lot of comics and fast paced action packed novels from the likes of Tom Clancy and Frederick Forsyth. New to writing, but doesn't shy away from connecting with stories and experiences. Loves adventure and the outdoors.